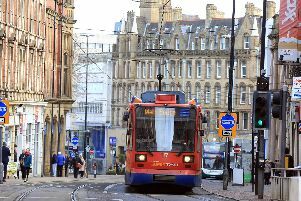 A teenage girl has been killed and a teen boy is fighting for life in hospital after a bus smash in Sheffield city centre. Emergency services were called to Haymarket, near Castle Street, in the city centre at 4.45pm last night. The teen girl died as a result of injures sustained in a collision with a bus. South Yorkshire Police were unable to confirm the age of the girl, or of the boy taken to Northern General Hospital with life-threatening injuries. First Bus director for South Yorkshire Kevin Belfield said the firm is ‘shocked and saddened’ about the incident, the cause of which is still unknown. A spokesman for the police said: “Just before 5pm, two pedestrians were involved in a collision with a bus on Haymarket at the junction with Castle Street. One of the pedestrians died as a result of their injuries and the other remains in a serious condition in hospital. Kevin Belfield, Managing Director of First South Yorkshire said: “I am shocked and saddened by what has happened. My thoughts are with everyone who has been affected by this tragic incident. “I would like to thank the emergency services and colleagues for all they have done in difficult circumstances. “Following the incident First South Yorkshire immediately implemented their emergency procedures and sent representatives to the scene to provide support to those involved and the emergency services. Anyone with information is asked to call police on 101 quoting incident number 823 of 11 December. Bus accident at the junction of Castle Street and Haymarket in Sheffield.